When I watched the trailer for this film, I knew it would be vividly intense and one of the more difficult films I’ve watched. 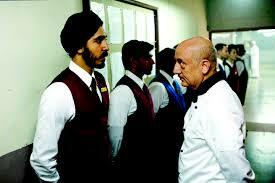 Yet, I also wanted to see it, knowing that it had some fantastic actors involved, such as Dev Patel and Anupam Kher. While the movie depicts a tragic moment of terrorism, it also captures incredible scenes of bravery, spotlighting heroism and humanity, people coming together to do what they can to help one another. It is brilliantly written, has powerful scenes and highly emotional acting. “Hotel Mumbai” is a thriller film directed by Anthony Maras, written by John Collee and Maras and based on a 2009 documentary “Surviving Mumbai” about the 2008 Mumbai attacks at the Taj Mahal Hotel in India. Focusing on the guests and staff of the hotel, it vividly recounts the siege of the hotel by a group of terrorists. The terrorists make targeted attacks across Mumbai, culminating in the attack on the Taj Mahal. Refusing to leave their guests, renowned chef Hemant Oberoi (Anupam Kher) and waiter Anjun (Dev Patel) risk their lives to keep everyone safe. While the militants search for survivors, one desperate couple (Armie Hammer) and (Nazanin Boniadi) are forced to make unthinkable sacrifices to protect their newborn infant with the help of their nanny (Tilda Cobham-Hervey) and another guest, Russian Vasili (Jason Isaacs). The film is a nail-biting thriller that is fraught with tension and graphic scenes of violence. In 2008, 10 members of Lashkar-e-Taiba, an Islamic terrorist organization based in Pakistan, carried out a series of 12 coordinated shooting and bombing attacks lasting four days across Mumbai. The writing puts the viewer into that point in time, beginning with the shooters as they are directed where to go and what to do by their leaders and moving forward to bring our focus to those working or staying at the Hotel Taj Mahal. Choosing to begin with Anjun, Dev Patel’s character as he gets prepared for work gives the viewer someone to empathize with immediately. We also are introduced to other guests, David and Zahra, newly married with an infant son, their nanny and Russian Vasili. 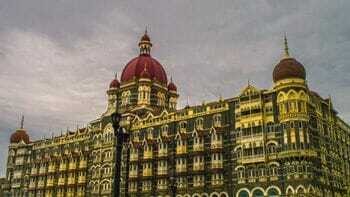 The writing builds as the terrorists begin their attacks and culminate to the siege of the Taj Mahal Hotel. While the action is intense, there are moments of humanity, sacrifice, and grace that allow the viewer to see what the survivors endured and how many acts of individual bravery happened during the siege of the hotel. This is not a story that is easy to view but it does show the remarkable strength of the staff of the hotel and the sacrifices that allowed a great many people to survive. Moreover, the story ends on a note of beauty and hope. One of the techniques that I feel aids the film in creating and maintaining the tension is the way the film moves between the young men perpetrating the attacks and the individuals attempting to survive. By giving us the militant’s point of view, it increasing the tension while also not allowing them to become black and white caricatures of villains. The young men, despite the attack, are humanized and it gives us an insight into how their beliefs are twisted and used to create hate and violence. We also see how that same fear in the victims makes them attack each other and how the victims pull together in the end to survive. We are presented with the darkest side of humanity alongside moments of breathtaking beauty, just as we are given the contrast of the beautiful hotel with the desperate poverty of Mumbai. In presenting multiple viewpoints, the film prevents caricatures of people and instead shows how zealotry and hate can twist humanity. The cinematography is without question some of the best I’ve seen. The film flips between the detailed, gorgeous hotel to people waiting for news of their loved ones. Interspersing real news footage back and forth with the film highlights the reality of the event and adds layers to the tension and terror. It also gives information about the readiness of India for this kind of attack and how unprepared the police forces were in the face of this kind of coordinated attack. Individual moments capturing the faces of the people trapped in the hotel is emotionally gripping and haunting as the viewer sees so many just trying to survive while others are cut down before they even have a chance to get away from the terrorists. The details are what make it so brutal and tragic. The performances are what cement the realism and authenticity of this film. Dev Patel is amazing as Anjun, the fear showing in his expressions even while he thinks first for the guests and then for his own safety is part of what makes the film so exceptional. His performance is emotional and powerful, his desire to survive to get back to his family even while he stays to save guests an act of bravery against the darker moments in the movie. Anupam Kher as Chef Oberoi is a perfect choice in casting. He plays his performance as a man not without fear but unwilling to allow others to stay in danger. His character attempts to reassure others when none of the staff know what will ultimately happen. There is an especially emotionally charged scene between him and Anjun that is charged with beauty and humanity at its best. 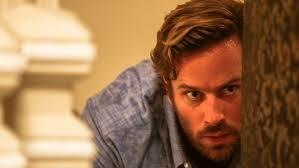 Armie Hammer does a great job of showing fear and displaying moments of sacrifice. Nazanin Boniadi as Zahra is compelling, her performance fraught with emotion and haunting in its beauty. Even the secondary characters in smaller roles are directed to perfection, their acting strong and helping create a dynamic film. The film is haunting and graphic, yes. There are intense scenes that depict moments of death and scenes of horrible brutality. It is terrible, yet beautiful and full of bravery. Of those who died in the hotel, half were staff that stayed behind to help their guests survive. That kind of bravery deserves a voice, deserves to be heard as much as the bravery of the United States depiction of 9-11. While it is not a movie for the faint of heart, it is a story that should be heard, bravery that needs to be spotlighted and allows us to see the very best of humanity. If you like thrillers, or you find compelling, complex stories of history engaging, this is a film you might enjoy. I found it gripping, powerful and worth every minute of my time.